A journal entry is made to record transactions that are not otherwise being recorded in another module. This might include things like: bank fees, donations & grants, credit cards, fund transfers, depreciation, petty cash and miscellaneous corrections. Click the General Journal icon on the toolbar. It doesn’t matter which vendor is displayed since journal entries are not linked to a vendor. Click New Entry (lower left). Choose a Post Date (date the entry is recorded). Enter a Comment (optional) to help explain this entry. 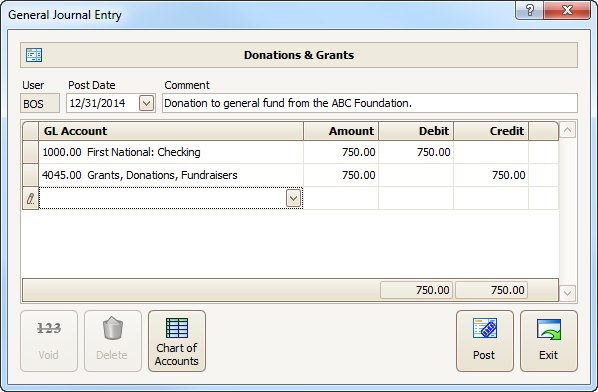 Note 1: Each journal entry must include at least two lines in order to have a “balanced” entry, for example a donation would affect both your bank account and donation revenue. Note 2: In some cases the Amount should be entered as a negative number, like -25.00. This is appropriate if the item is decreasing, such as when your checking account decreases due to a bank fee. Click Post to record the entry then click Exit. The Debit and Credit columns must be equal. Note: Questions about account numbers, debits & credits, and proper journal entries should be addressed to an accounting professional. Procare cannot offer accounting advice. 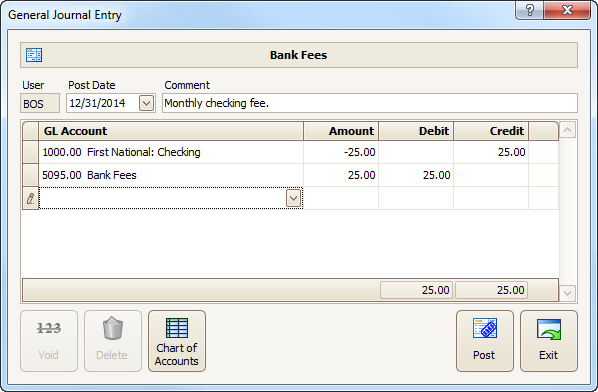 Note: As an alternative, bank fees can be entered on the Reconcile Bank Accounts screen.